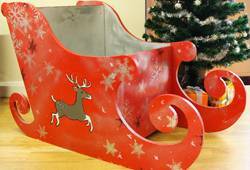 A unique way of visual merchandising, our MDF Santa Sleigh is perfect for festive displays! The creativity is in your hands with this unfinished MDF sleigh. Sand it, paint it, wrap it, or spray it - the choice is yours!